ISE, Amsterdam – February 6, 2019 -- intoPIX, leading provider of innovative image processing technologies for professional media applications, announced today that Audinate, leading provider of professional digital audio networking technologies, will use intoPIX’s ProAV optimized ultra-low-latency JPEG 2000 technology within their new Dante AV Design Suite™ for use with the newly announced Dante AV Module™. 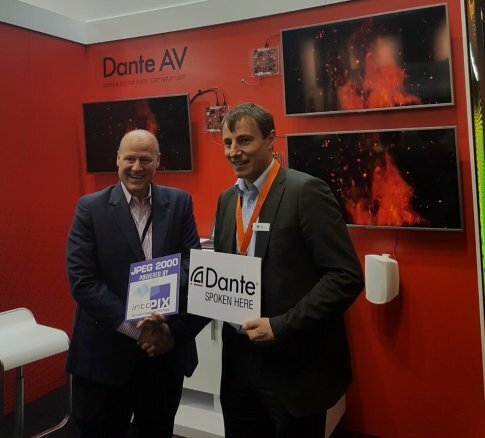 At ISE 2019 Audinate is launching Dante AV as a video-capable extension to the world’s most popular audio-over-IP ecosystem Dante. It provides ease of use, seamless multi-vendor interoperability and integrated control experience. The Dante AV Module will be unveiled at Integrated Systems Europe (ISE) 2019 in Amsterdam, Netherlands on 5-8 February, Hall 7, Stand C230. intoPIX will demonstrate their JPEG 2000 ULL next to other technologies for AV-over-IP on their stand 10 N-199. intoPIX creates and delivers innovative of image processing, video compression, and security technologies to professional AV equipment manufacturers. We are passionate about offering people a higher quality image experience and have developed FPGA/ASIC IP-cores and software tools that form the basis to high quality AV over IP and AV over wireless solutions. We enable the world to manage more pixels over existing networks, while reducing power consumption with a best-in-class image quality and microsecond latency. Audinate Group Ltd (ASX:AD8) has a vision to pioneer the future of AV. Audinate’s award winning Dante AV over IP networking solution is the worldwide leader and used extensively in the professional live sound, commercial installation, broadcast, public address, and recording industries. Dante replaces traditional analogue cables by transmitting perfectly synchronized audio and video signals across large distances, to multiple locations at once, using nothing more than an Ethernet cable. Audinate is headquartered in Australia and has regional offices in the United States, United Kingdom and Hong Kong. Dante technology powers products available from hundreds of leading AV manufacturers around the world. The company’s ordinary shares are traded on the Australian Securities Exchange (ASX) under the ticker code AD8.